For other uses, see Twin Mounds (disambiguation). The Twin Mounds Site (15BA2) (also known as the Nolan Site) is a Mississippian culture archaeological site located near Barlow in Ballard County, Kentucky, just north of the confluence of the Ohio and Mississippi Rivers. The site consists of two large platform mounds around a central plaza and a large 2 metres (6.6 ft) thick midden area. The site was occupied from 1200 to about 1450 CE during the Dorena and Medley Phases of the local chronology. For most of its history, it was contemporaneous with another local site, Wickliffe Mounds, which is several miles to the southeast. It is thought that when Wickliffe was slowly abandoned around 1300, the population had been slowly relocating to the Twin Mounds Site. A rare Cahokia made Missouri flint clay 17.8 centimetres (7.0 in) human effigy pipe was found during excavations at the site. ^ Townsend, Richard F.; Sharp, Richard V., eds. (2004-10-11). Hero, Hawk, and Open Hand: American Indian Art of the Ancient Midwest and South. Yale University Press. ISBN 978-0-300-10601-5. 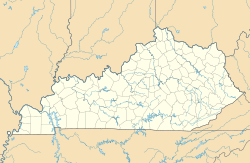 This Ballard County, Kentucky state location article is a stub. You can help Wikipedia by expanding it.